If your little guy is the one most likely to be caught tinkering with things mechanical, this Moto Jacket is just the thing. 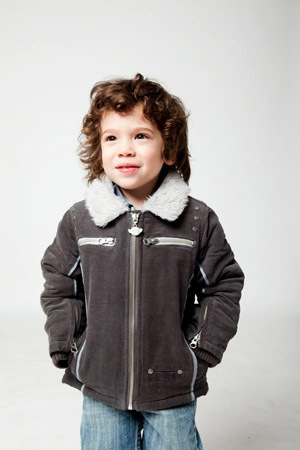 Appaman created this beautiful jacket that would look at home in the playground or the garage. This zipper, snap front jacket with quilted lining is what every speedster needs! Available in stain-forgiving chestnut brown. Two left. This heavy cotton pullover hoodie is great for the cooler months ahead. In chili red to better your chances at picking him out from that writhing mass of children in the playground. This classic needs no other embellishment other than the Appaman logo -- a micro one at the front and a good-sized, eye-catching one at the back. Last one in size 2T. Appaman adds another down coat to its winter line. This Drammen Coat is a little longer than the Puffy Coat and is super warm. It has all the requisite kid-friendly features including a hood and side pockets. It's also in this beautiful leaf green colour. Polyester shell, duck down fill. Last one. Appaman, you had us with the racing flags! For little boys obsessed with race cars and all things that go vroom vroom. 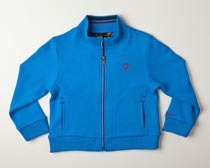 Beautiful zip jacket in marine blue with contrast yellow stripes. Nylon shell and polyester fill. Two left. No Piagetian question here: it's positively NOT from your nurturing, your child's obsession with trucks and machines. Feed your little boy's (or girl's!) fix-it DNA with this great Mechanics Jacket from Knuckleheads. It's black with logo patch at the back. Black cotton twill lined with red/black buffalo flannel. 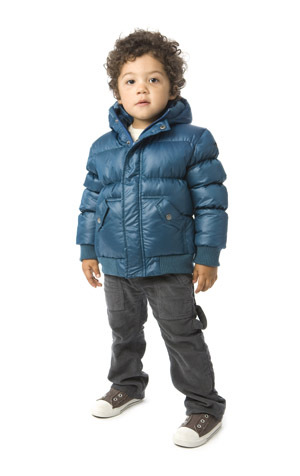 (Size guide: Small 6-12 months, Medium 12-24 months, Large 2- 4 years.) Last one. Yes, we have it! The Appaman Mod Suit in vintage black. 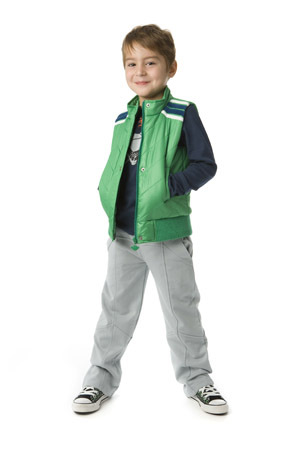 A welcome addition to your son's dress-up wardrobe -- slim pants with wide slash pockets, two-button jacket with skinny lapels and flap pockets. Wear it with one of the Appaman tees and he's all set to rock, like the other celeb kids seen with this outfit -- Kingston and Zuma to name(drop) a couple. Two left. 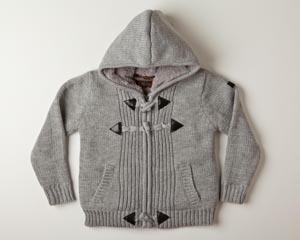 This knitted grey hoodie from Ben Sherman is a great jacket for a little boy about town. Zip up style with great old-school fasteners for extra style. It's back! 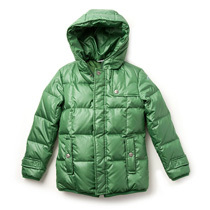 The Appaman hooded puffy coat is back. 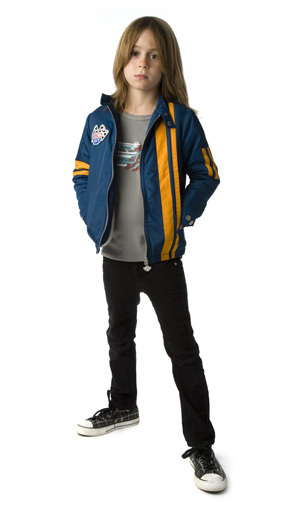 Same great quality, down-filled jacket, but this time in this oh-so-cool Skater Blue. Order today. These don't last long. (Looks awesome on a little girl a well.) Also available in silver. Sold out. This Ben Sherman knitted jacket in teal with contrast stripes on cuff and hem looks just as cool this millennium as it did in the 70s. Four -- count them -- four(!) front pockets. But herein lies the main difference: the 70s version would have had pockets for hockey cards and marbles. 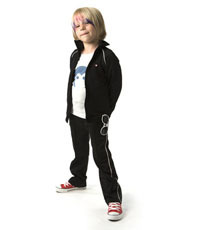 The pockets in this updated version are more likely to hold earbuds, an iPod and, when Mommy parts with it, her iPhone. Sk8tr cred. Check. Black and grey logo. Check. Stripes. Check. REVERSIBLE. Check and check! The thing that parents know is that at one point of this hoodie's lifecycle, there will actually be a need for the reversible feature. A smidge of mustard dribble and you're about to meet mom? Just reverse it and no one will be the wiser! One side with Knuckleheads logo, the other side with stripes. Sorry. Sold out. Wanna see a grown-man weep? 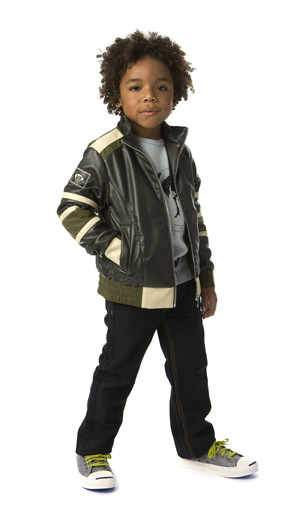 Put your little man in this faux-leather jacket by Appaman then tell him it only comes in boy sizes. Dubbed as the new "it" jacket for the season. A truly great coat for little boys, especially those who dream of motorcycles and engines 24 hours a day. Vroom. Vroom. Only two left. 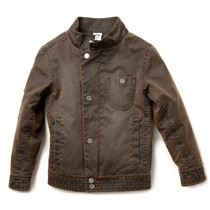 Great little go-to heavy cotton jacket for layering or just looking cool in. Alaskan Blue with contrast red and white on front zipper and Ben Sherman logo on front. Side slit pockets to keep his fingers tucked away or to hide anything he finds worthy of taking home that day: leaves, rocks, whatever. The Appaman English Biker Jacket is back by popular demand. Faux fur collar, contrast trim, front zip pockets, and lots more details. We especially love the zip at the wrists -- the better to don his driving gloves with! Warm, stylin, hot. It's a winner. 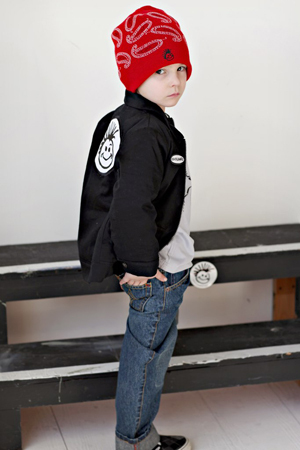 100% cotton corduroy with polyester fill. 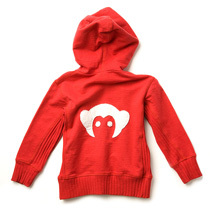 Summer's hottest colour in this great Knuckleheads hoodie! Turquoise with black stitching. The silkscreened thumbs up graphics and thumb holes add a sense of humour. Beach wear for sure, and whatever activity du jour -- hunting for treasure, eating ice cream cones, cycling, boarding, boating, etc. etc. Last one! Size 2T. This charcoal zip-up jacket with matching pants is another great Appaman Baby find. The subtle overall paisley pattern on the jacket adds a little exotic touch. A bit of a splurge at this price, but I guarantee you, it would be the favourite present received by one grateful mom. Would look sweet on a little girl as well. Two left. 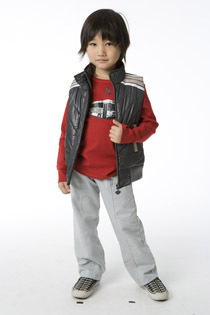 This Appaman quilted vest in vintage black is going to be the most useful thing in your front hall closet. Perfect for slightly nippy days as an extra layer over a long-sleeved shirt or sweater, or under a coat in the teeth-chattering frigid days when he insists on going out anyway. 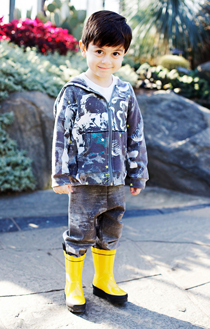 This all-season wardrobe staple is a worthwhile investment, and one that he might actually wear! Last one. 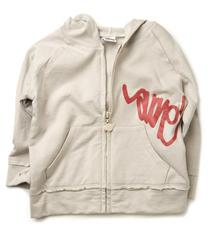 From Appaman's debut collaboration with Brooklyn artist Avone, this cotton hoodie is a must-have all-season topper. Get it before it's all gone. 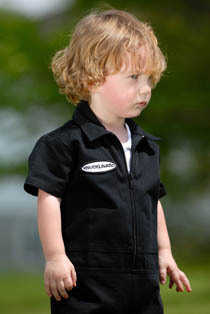 The Appaman Baby debut collection features this outstanding jacket and pant set. Steel blue plaid with blue trim jacket and the softest, nicest pants around. Another excellent choice for gift-giving. Check out the matching onesies and blankets, too. Sold out. This zippered hoodie from House of Mongrel is out of this world! 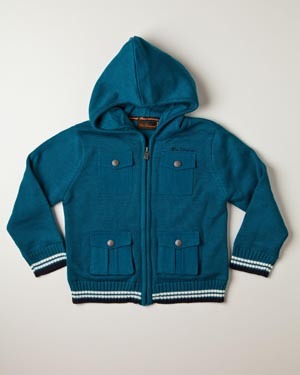 A must-have for your guy's wardrobe, this rocket hoodie in green organic fleece is perfect for keeping the chill away. Sold out.